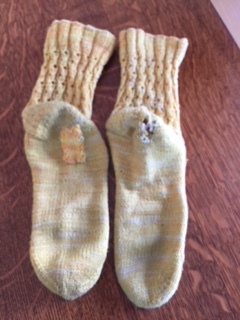 Redflags in scientific research, Knit in place sock patches; Tips for re-knitting a pattern; The world’s last old growth redwood forrest; Give-aways for membership incentives and books. We have another membership incentive give away and another book giveaway. In this episode of Teaching Your Brain to Knit, we look out for Red Flags in Scientific Research, learn a knit-in- place patch repair for socks, offer tips for knitting a pattern for the second time; discover the world’s last coastal redwood forrest; PLUS offer giveaways for the membership incentive and book de-stash.